Clicking on the title above will take you to a great little article on "Mother Linda's" blog. 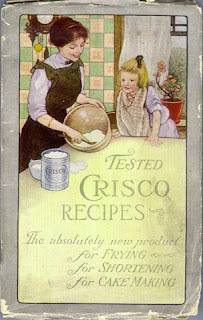 In 1911, Proctor and Gamble began marketing the first hydrogenated shortening called Crisco. They sold us on the image of a sophisticated woman, in a clean modern kitchen, cooking something delicious for her family using Crisco. Today however, there is a consensus that trans fats are more unhealthy than animal fats, not essential for our diet, and provide no known benefit to human health. Hydrogenation converts liquid vegetable oils to solid or semi-solid fats. Some of the fats produced using this technique are in a "trans" chemical configuration so we call them trans fats. Nature does not produce fats in this form. Many scientists theorize that our bodies' enzymes that metabolize fats do not recognize trans fats so these rogue fats may circulate in our bodies longer and are more likely to deposit on our arteries causing plaques that give us coronary artery disease. The vegetable oil Proctor and Gamble used to make Crisco is cottonseed oil. Cotton is sprayed with with strong defoliating chemicals just before harvesting. This makes it easy for chemicals to find their way into the final product. Crisco is an unnatural fat first of all. Then, it's manufactured in a way that exposes us to potential contaminants. The drama surrounding high fructose corn syrup (HFCS) is eerily similar to Crisco's history and trans fats in many respects. See Dr. Mark Hyman's article about HFCS. Both products are in forms that don't occur in nature. Both companies didn't know their products were unhealthy in the beginning. Both companies made a conscious effort to suppress the truth after they learned their products were not as wholesome as they originally hoped. Both products are exposed to hazardous contaminants in the manufacturing process. Both companies have taken inadequate measures to ensure these contaminants don't end up in our food supply. Both companies have appealed to our "sophistication" in their efforts to persuade us that their products are safe and healthy. I like the way history can strip away fog from present controversies. I bet this pattern repeats itself often. However, I would be interested in learning about a company that did not follow this storyline with a profitable product. I hope you enjoy Mother Linda's article. * When I refer to "company" in reference to HFCS, I mean the Corn Refiners Association since one single company does not make HFCS.